Mile for mile, no stretch of whitewater in North America compares to the Forks of the Kern. This 22 mile rafting trip features huge Class V drops and continuous Class IV whitewater framed by some of the most spectacular canyon scenery in the west. Space is limited and trips fill quickly, so please call or email to inquire about dates. Trip Meeting Place: 6602 Wofford Blvd, Wofford Heights, CA 93285. Google Map. Trip Meeting Time: Evening before your trip. 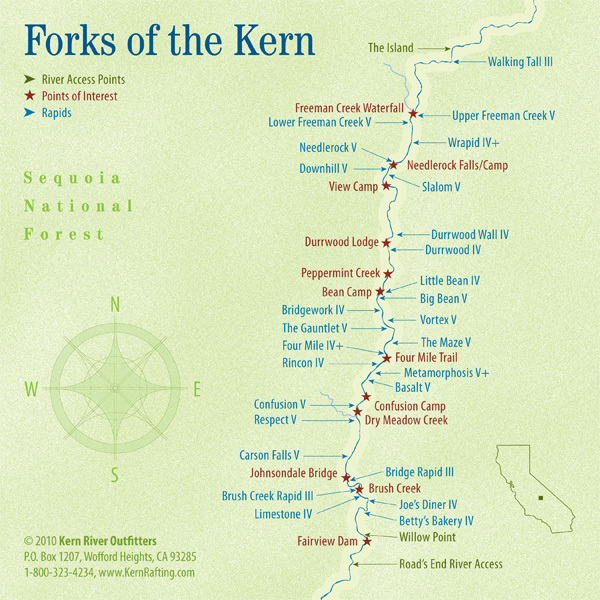 Trip Packet: Click here to view the Forks of the Kern trip packet. Three Day: Three day trips are available on a charter basis. Please call or email for trip dates. Approximately 22 miles of rafting, split into two full days. Rapids are Class III, IV, and V.
Meals included are day 1 lunch, day 1 dinner, day 2 breakfast, and day 2 lunch. There is a 3-mile hike to the put-in on day-1. The Forks canyon is remote and spectacular. This trip is geared towards experienced rafters in good physical condition. 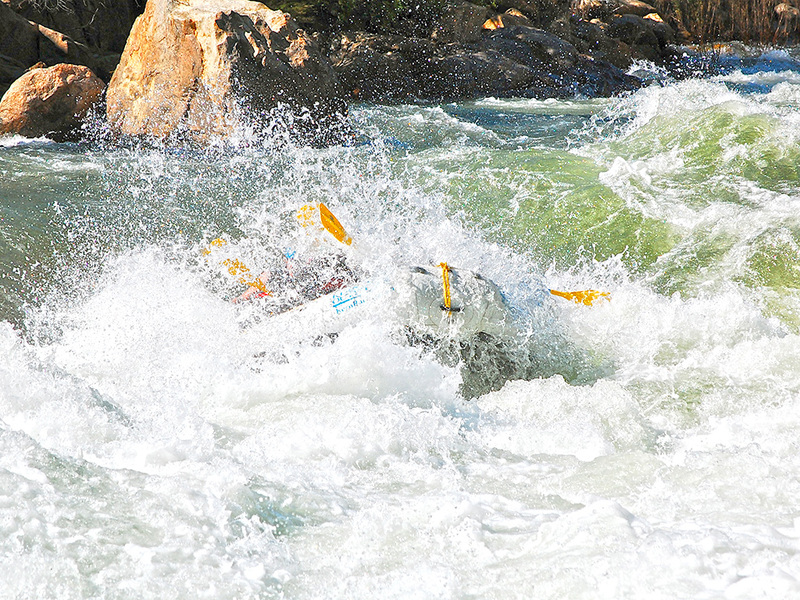 The Forks of the Kern has some of the world’s most famous whitewater – but the trip is more than just rapids. The canyon that we travel through offers beautiful side-hikes to towering waterfalls, amazing views of the “Needles”, and spectacular camping spots along the bank of the river. The Forks of the Kern originates near Mt. Whitney in the Golden Trout Wilderness. It is much more strenuous than other river trips and guests should be in good shape. We require that all guests have good stamina and take an evaluation swim. The canyon is steep and remote. 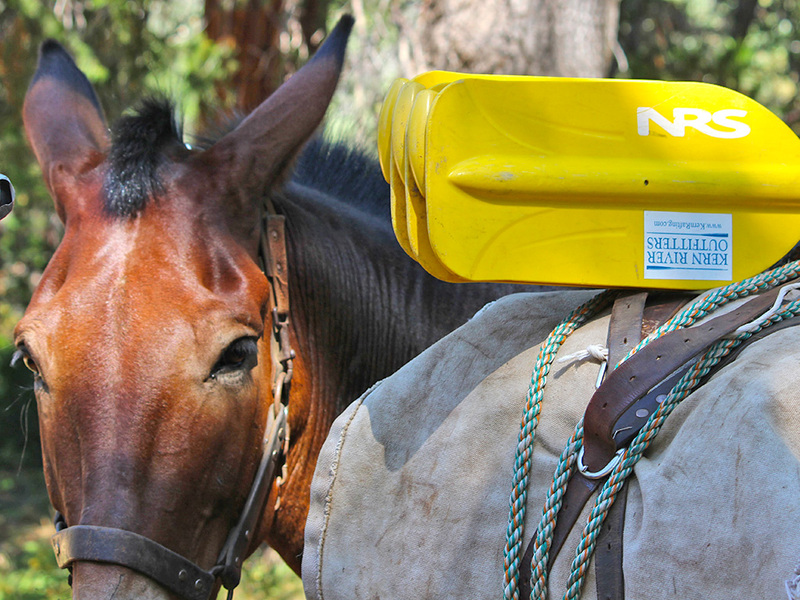 We utilize horses and mules to carry our rafts to the river. Guides and guests hike the 3 miles to put-in carrying their own gear. Trips are limited to 15 guests. 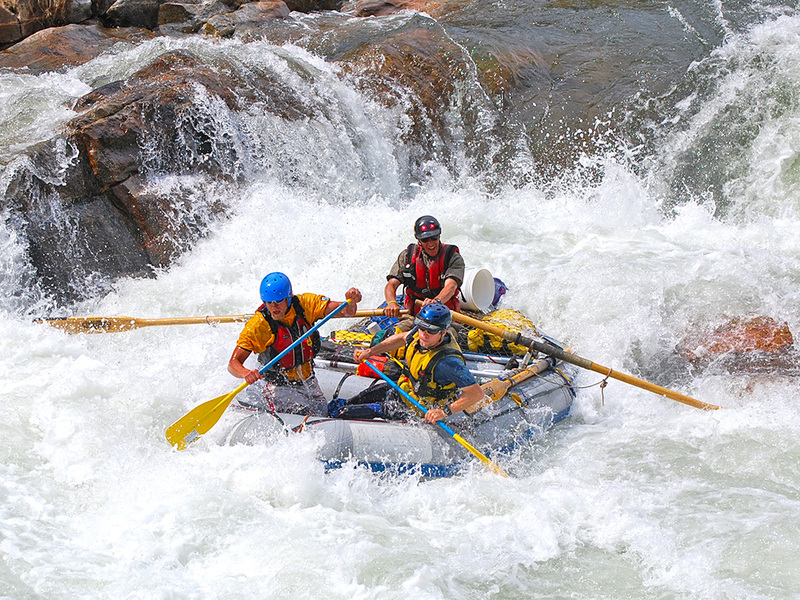 A full trip typically has two paddle rafts and four oar/paddle set-ups. Our trip fares includes the use of wetsuits, paddling jackets and waterproof bags for personal gear. Most of our Forks guests spend the evening before their trip in the Kern Valley at one of the many motels in the area. Our office will be happy to assist with your pre and/or post trip lodging plans. The guides, excluding the trip leader, load all the equipment into the rig and meet the packers at the trailhead to the river. Boats are carefully loaded onto the mules, as well as coolers, and other gear. They then pack them down to the river. Guides hike their personal bags, throw bags, oars and other loose ends down the trail. After the 3-mile hike, they’re at the island – the confluence of Little Kern and the main Kern. This is the trips launching point. They help the packers unload the mules, and begin rigging the trip. That night guests arrive in Kernville, and check into their hotel room. That evening they meet their Trip Leader and they go over the Pre-Trip Meeting. Waterproof bags are handed out and the guests pack their personal trip items into this bag, which they will later hike down to the river. Guests meet at the Kern River Outfitters Rafting Center at 7:00AM, where the Trip Leader hands out additional equipment such as a wetsuit and lifejacket to the guests. They board a bus, and drive to the Kern River, where the Trip Leader reviews safety issues relevant to running a river as challenging as the Forks, and they evaluate the ability of guests in dealing with these situations. This evaluation is our Swim and Run test. After completing the evaluation, we board the bus and drive to the Forks of the Kern trailhead. At the trailhead, we hike 3 miles down to The Island and meet the rest of the guides. Boats are rigged and ready to go. The Trip Leader gives a Safety Talk, and the guides each give their own Paddling Talk. We warm up with Walking Tall Rapid and other class III+/IV whitewater. The first real test is Upper and Lower Freeman Creek rapids: Both challenging class-Vs. After, we run more class III/IV whitewater and then break for lunch. Later that day, with time permitting, we pause at a side hike to explore a creek canyon. After the break we hit more class IV and V rapids, and then we stop for our camp. Guides set up camp and kitchen while guests put together their own camp set ups. Delicious and hearty appetizers and dinner are served before hitting the sleeping bag under the stars. With breakfast served, and camp broken down, we load into the rafts and push off earlier than yesterday to tackle the whitewater. Today there is a slew of big rapids: Vortex, The Gauntlet, The Maze, Four Mile, Rincon, Metamorphis, Basalt, are all demanding class IV+, V and V+ rapids. Lunch is served in-between the action, and moments of solitude in the secluded river canyon break up the day. Towards the end of the day, the Forks of the Kern ends with a dramatic exit at Carson Falls: A Class-V drop that is closer to a waterfall than a rapid. A few miles downstream, you pass Johnsondale Bridge, marking the end of the Forks and the beginning of the Upper Kern section. A handful of class III and IV rapids lead you to takeout. The best time to go changes every season. Snowpack and runoff dictate when our window to run the Forks is open. For example, our 2017 high water season we had all of our launches occur in August. Last year in 2018 we ran our trips in early June. We can begin making estimates on our flow window in late January, but it still might take until mid-April for us to open reservations. We consider our scheduling conservative, so generally speaking, if we have a launch open and available to book, then we believe that date is in the ballpark of ‘best’ time of the season. What’s the minimum age for this trip? Class V trips such as the Forks of the Kern have a minimum age of 16 years old. When are your launch dates? Our permit launch dates remain the same every year. April 21, 26. May 5, 10, 15, 20, 25, 30. June 5, 10, 15, 20, 25, 30. July 5, 10, 15, 20, 25, 30. August 4, 9, 14, 19, 24, 29. How does the interest/wait list work? Throughout the Fall, Winter and early Spring we build an interest list for our Forks of the Kern trips. Once we have analyzed our snowpack and have set a window of availability, we email everybody at the same time with our launch schedule. From that point, reservations are first come, first served. If you would like to be added to this list, please email us letting us know. Please note, we reset the list annually. How many people can you take per trip? Are group discounts available? Forks of the Kern trips are intimate, with just 15 guests per launch. A ten percent group discount is available for parties of 10 or more, for any launch excluding Saturday starts. 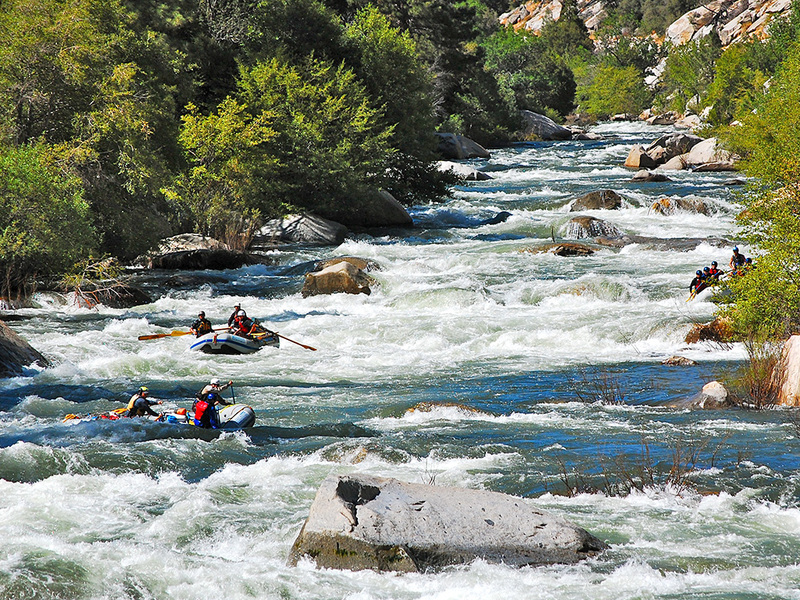 NEED HELP PLANNING YOUR KERN RIVER RAFTING TRIP?